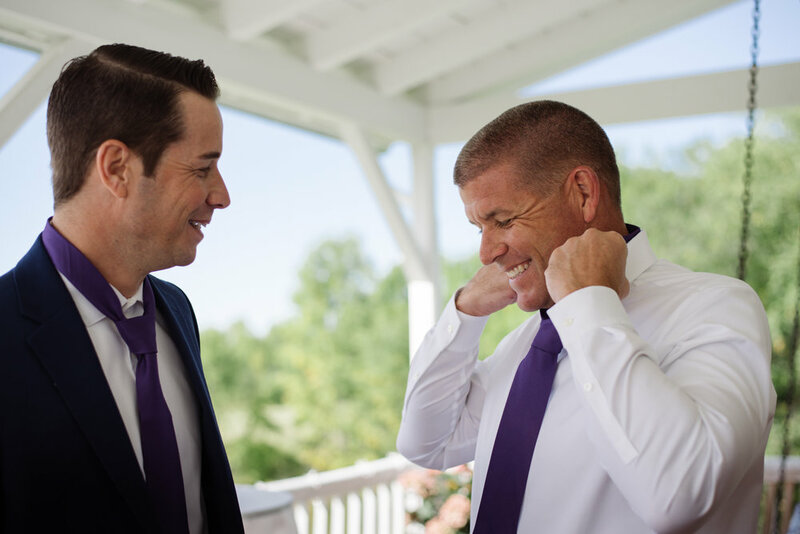 Chaipel & Mitch married on September 8, 2018 in New Haven, Vermont. 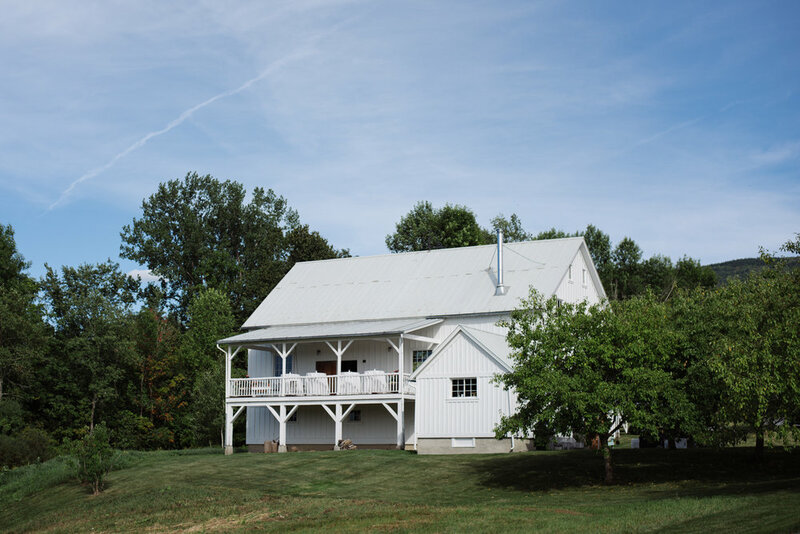 You might recognize this location from Sarah & Tom’s Edelweiss-Inspired Wedding. 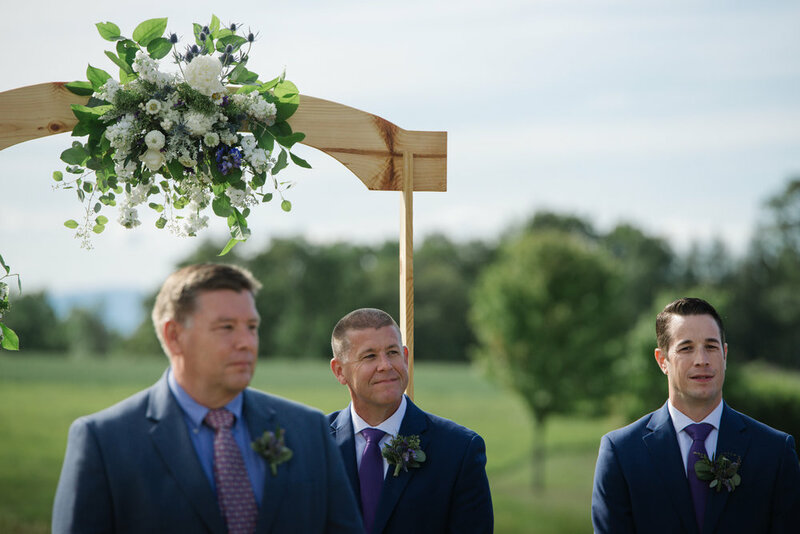 Chaipel & Mitch are close friends with the home owners and when they offered up their property for the wedding, it seemed like the perfect spot to tie the knot! Once was in her Vera Wang gown, her family presented her with two special items for her to have on her wedding day. The second item was her father’s wedding ring. Meanwhile, Mitch’s wedding party made sure he was looking dapper for the ceremony. 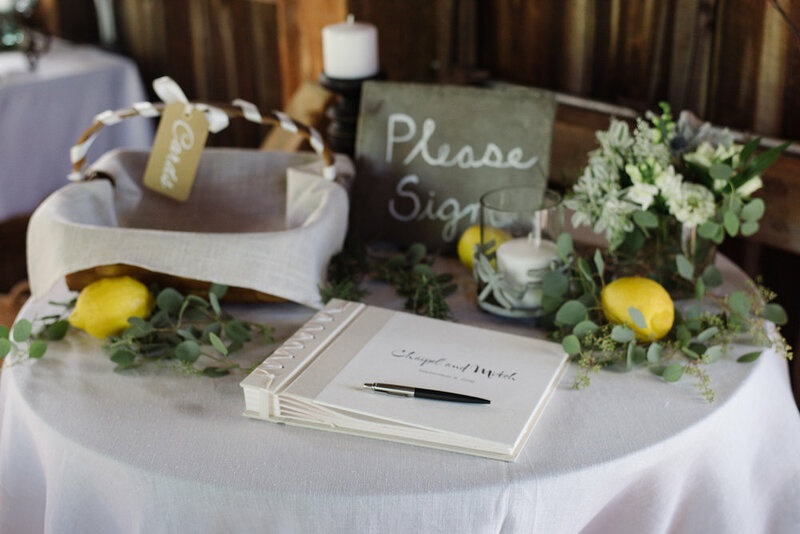 “We wanted our wedding to be small and personal, and all about family. Mitch built the arbor we were married under from wood from the property in Westmoreland. We had so many family members participate: Mitch’s brother Bob married us, his brother Ed was a groomsman, and his nephew Dan was his best man. My sisters Anne and Kate were my bridesmaids and readings were done by Mitch’s daughters, Ivy and Fallon and my nieces Dorothy, Violet, and Claire. Our cake was made by Mitch’s niece Kate and our band was headed up by his nephew Chris. Lastly, my nephew Will walked me down the aisle and to top it all off our labradoodle Finn was our ring bearer! The reception was full of Italian and Scottish inspired touches. 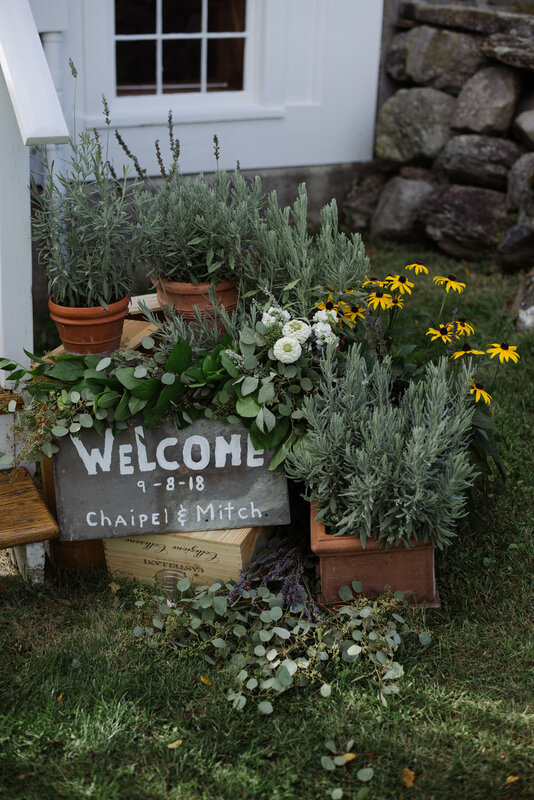 “We had been on a walking vacation to the Amalfi Coast in 2016 and loved it so much we added a few Italian touches to our flower displays including lemons and Italian wooden wine crates, and we had our reception catered by Woodbelly Pizza out of Montpelier, who does mobile wood-fired pizza oven pizzas. It was a huge hit! 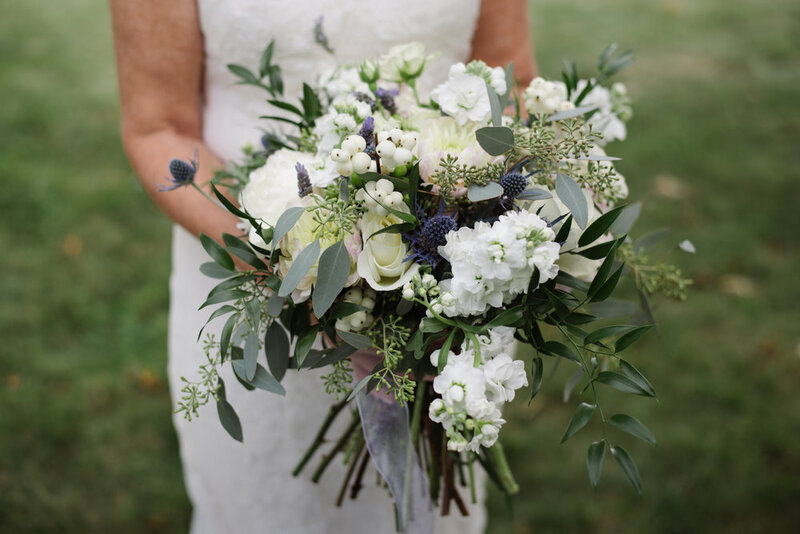 The flowers were really important to me and we used a local florist, New Leaf Organics, who did an absolutely amazing job. 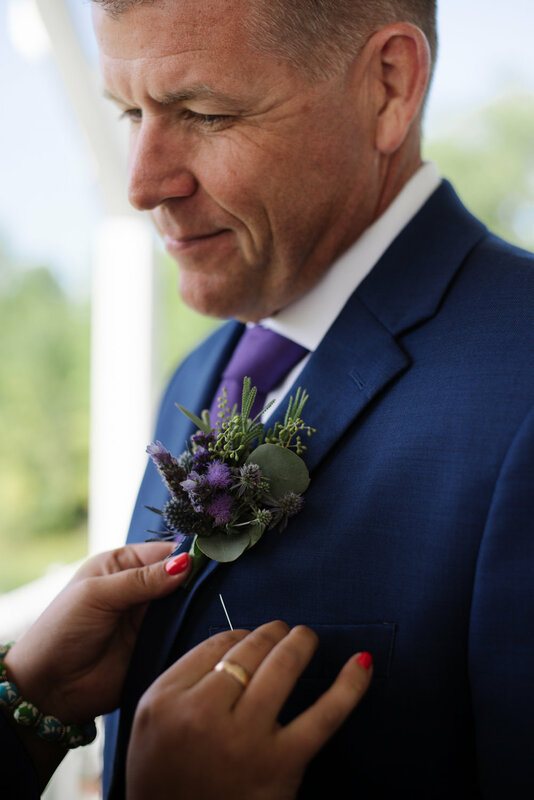 The flowers were all grown locally and we included lots of lavender and Scottish thistle, since my husband’s dad was very proud of his Scottish heritage. As a surprise for Mitch, I also had a local award-winning bagpiper play the recessional music at our ceremony and during cocktail hour! Mitch and I also included photos of our dads at our reception. Both were in the Navy so we had one for of each of them from that time back in the 1950s and one photo of them doing something they love. Mitch’s dad was holding a fish he caught in Lake Champlain, a place that holds many happy memories for Mitch and my dad was eating oysters in Wellfleet on Cape Cod, a place that holds a special place in my family’s heart. The wedding favors were hand etched wine glasses (over 75) with the word Amore, made by Mitch. Inside were chocolate mice from Burdick’s Chocolate in Walpole, NH, a favorite place of my dad’s and somewhere he often brought my nieces and nephew so happy memories for them as well. I asked Chaipel & Mitch what advice they have for other couples planning a wedding.